Something not terribly impressive from a Zorki rangefinder I picked up for $20 last year. As soon as I loaded it, I realized that the rangefinder was off. I adjusted it as best as I could and then... mostly left the camera sitting on my desk for the next 8 months. I don't think I got the adjustment entirely correct, but it's close enough that I can live with it. The rangefinder on my Ricoh 35s may be off for all I know, the damn thing is too hard to see and the focus action so stiff that I only use it for framing (I'd rather it was an uncluttered bright-frame finder), and zone focus. Which is ok, because that's how I habitually photograph with my SLRs apart from occasional close-ups. I only fuss much with the focus on my TLR, I guess because it has that flip up magnifier thing. I think camera was a Bessa R2 with a Skopar 2.5/35mm lens. Film is Ilford Surveillance film developed in Kodak developer. St Georges Terrace, Perth, Australia. After all these years after starting this thread, I love to pop back on and look through all your fantastic photographs people have uploaded. It really is a great place to get inspiration! Since starting this thread, I finished school, did my A-levels, then I went on to finish my degree in photography last year. I now work as a freelance photographer. I still carry a Pentax camera where ever I go. I bought a Pentax MX in black during my last year of university and used it exclusively for one of my documentary projects, I remember seeing the MX on here in black years ago and craved for one, I knew I'd get one eventually! 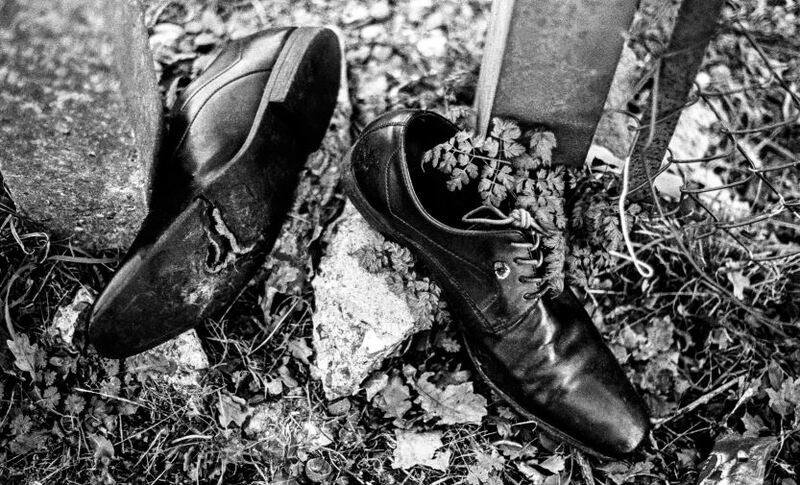 "Abandoned Shoes" - 2017, from my documentary project "Lobbed and Forgotten"
Last edited by Hayob; 04-15-2019 at 01:48 PM. Super Takumar 20mm and Kodak Tri-X. 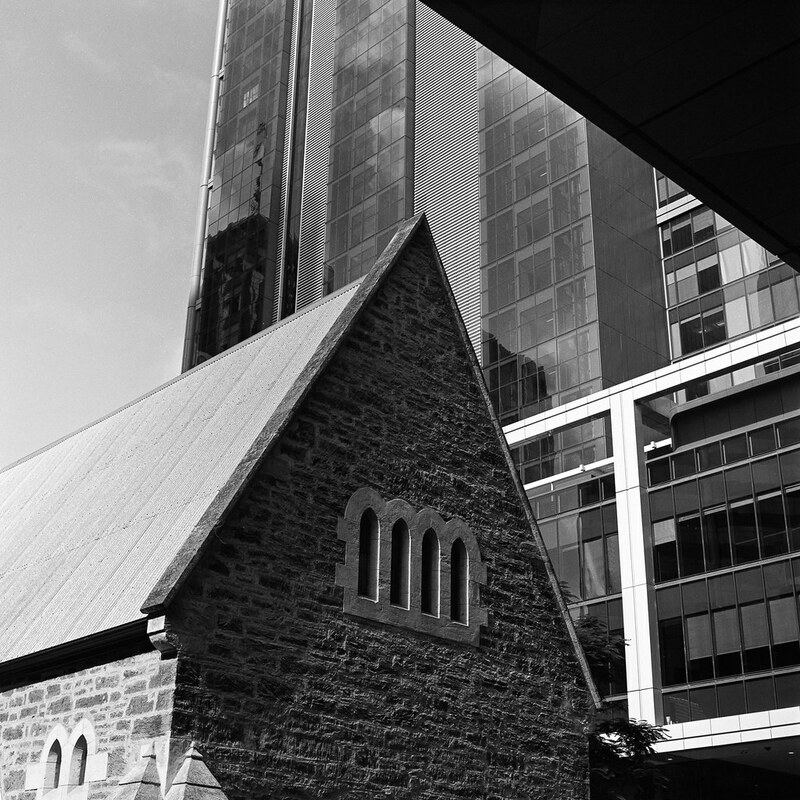 A couple of shots taken with a $15 Pentax IQZoom 70XL on Agfaphoto APX100 (which I understand is the same as Kentmere 100). Developed in HC-110. Its grainier than previously shot rolls of APX100. Part of that may be that this is the first roll I've posted in Lightroom instead of Aperture. I'm still learning my way around it, but so far its not making my pictures look as good as Aperture or Luminar. I did discover that it was automatically adding sharpening to the photos which had the effect of making the grain more pronounced. I removed that and they improved, but I'm still not thrilled (though I'm new to HC-110, and maybe that is part of it. 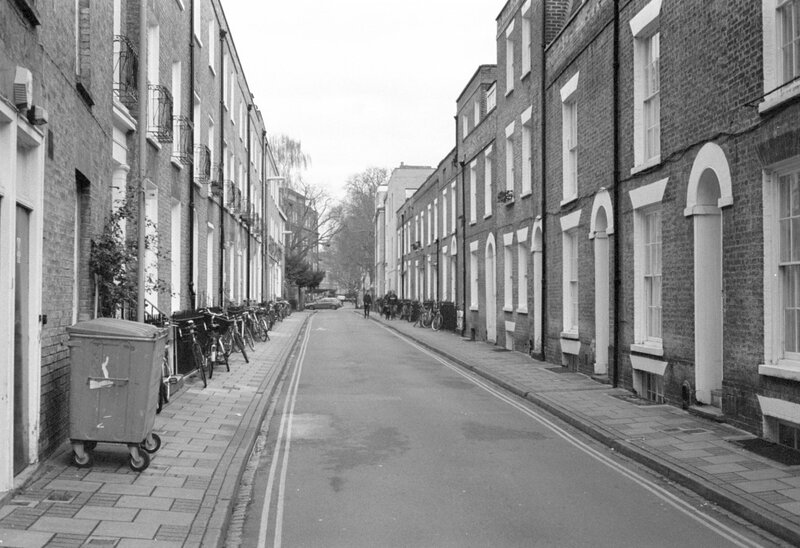 Previously I developed APX100 in Xtol. I been using Rodinal with RPX 100. And I've noticed my shadows seem to be more exposed than I expected with highlights on the edge. I decided to do a speed test. A speed test that places zone-one 0.10 density above base + fog and turned out to be EI 200. I'm Just wondering if you're experiences extra speed with APX 100? Nice to see the OP in this thread, and congrats on becoming a freelance photographer. What sort of work do you do? Thanks! I'm currently doing commercial work for a fair few local businesses and starting to dabble into the odd wedding. I don't have the equipment (or skill) to perform tests like that. Offhand, I'd say that at 100ISO it doesn't achieve the same density as TMAX100@100 or FP4+@125, but has a higher density than Rollei 80S@80. Of course thats eyeballing it, so take it with an enormous grain of salt. EDIT: I should add that the TMAX and FP4+ I'm comparing were with Xtol with times from the datasheets, the 80S was only with Rodinal with times and dilutions from the MDC, and the APX with HC-110 and Xtol, tims and dilutions from the MDC. Okay, thanks. I didn't expect you to do the test but rather what your feel for the film is. If you have a one-degree spot meter, btw, you can perform speed tests with it pretty economically via a hack. You can look it up. But in a nut shell, you reverse mount an old 50mm lens to a one-degree, make a stand to hold it and diffuse the light. Then use a calibrated step table such as Kodak's 21-step tablet no. 3 to calibrate it. It's functional enough with modest accuracy to look at your low and zone-eight densities. It can help you quantify your development without getting all scientific about it and useful for fine-tuning your development time to match your enlarger type if a person does wet printing. I do have a sekonic that has a 1degree (L-508). I’ll have to look into that. 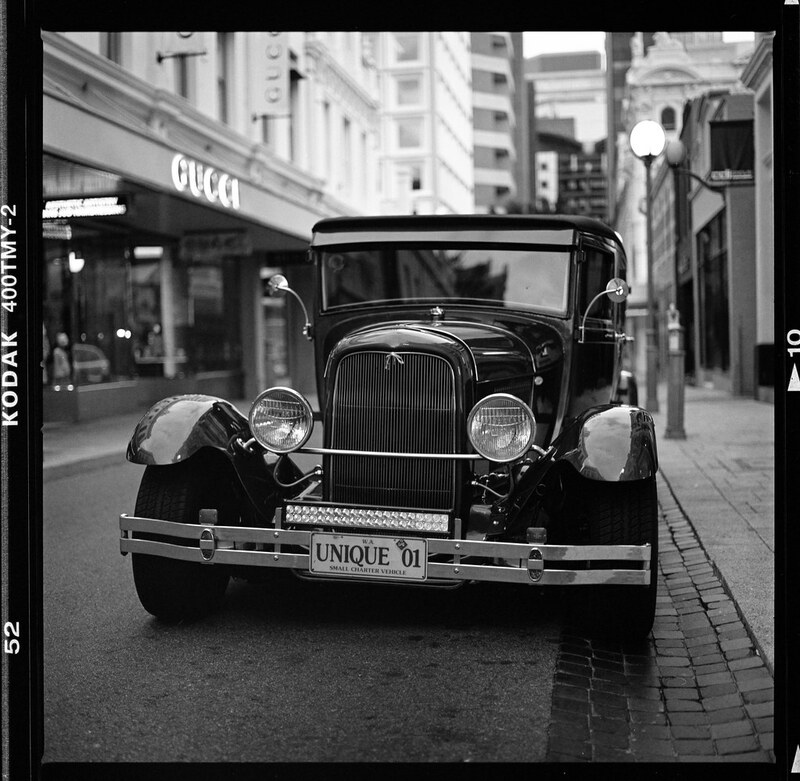 BW and old cars just seem to go together. All times are GMT -7. The time now is 07:41 AM. | See also: NikonForums.com, CanonForums.com part of our network of photo forums!